On a winter-whipped Tuesday in New York during Japan Week, the Consulate General of Japan, Japan Society and the Japan National Tourism Organization (JNTO) hosted a special event to herald Spring as the season of renewal, travel and tourism. The event was one of several in the city celebrating Japan Week 2014 and you could feel the warmth coming off the invitation. It turned out to be one of Japan Week’s genuine highlights. 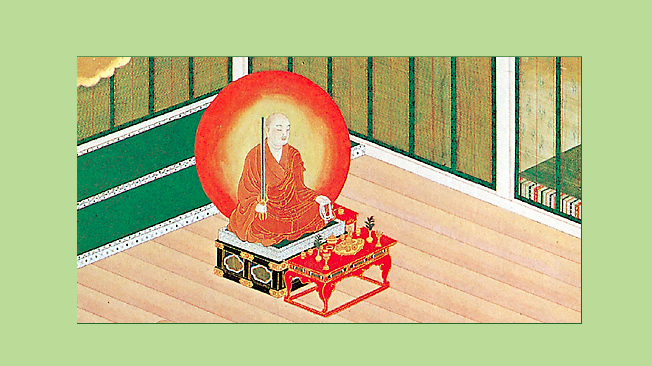 The thread running through the evening was Buddhism and its impact on Japan and its arts. True to form, the event was deftly orchestrated and presented by the Consulate General and JNTO at Japan Society’s headquarters in New York, a couple of blocks around the corner from the United Nations. The program was Zen-like, beginning with a slide show history of travel and tourism in Japan, leading to a live demonstration by Hiroki Ohara of Ikebana, the traditional Japanese art of communing with Nature through floral arrangement, followed by the lecture/discussion, Suspending the Buddhism Divide: The Indo-Tibetan & Japanese Mikkyo Bridge, featuring Columbia University Professor Robert Thurman (Uma’s Dad) and Kojun Arai, priest of Japan’s Shingon Buddhist sect and leading member of Buddhist ritual chanting group, Shomyo no Kai–Voices of a Thousand Years who capped the evening with Tibetan-inflected chanting of a very high order. Believe me, by the end of the evening, Spring was busting out all over! Still today, pilgrims dress in white and walk the 870-mile route, more as a soul-searching exercise than religious experience, but the need to handle large crowds and provide sustenance, guided tours and souvenirs for pilgrims led to the beginning of the tourism industry within Japan. Entire towns (Monzen Machi) sprouted in front of the gates of temples and shrines, followed by tea houses, food stalls and Omiyage (souvenirs), which were typically made of rice and sugar as these were luxury goods at that time and could be stored for long periods. Today, Kit Kat bars in various flavors serve that purpose and as “proof” given by temples to pilgrims and visitors to ratify their undertaking of a spiritual journey. As important as the pilgrimage to the 88 temples in Shikoku remains, Mecca for the Shingon Esoteric sect of Buddhism is Mount Koya, established in 816 by Kobo Daishi and designated a UNESCO World Heritage Site in 2004. Another important pilgrimage destination is the Ise Grand Shrine, in Ise-Shima National Park, the most-visited pilgrimage site since the 17th century and the largest and most-admired shrine dedicated to Japan’s tutelary gods. Itsukushima Shrine, on Miyajima Island located 8 miles southwest of Hiroshima, was established in 593 to honor three female deities and is built literally over the water. Another aspect of Buddhist culture is represented by Ikebana, the art of traditional Japanese flower arrangement, which began as the Buddhist activity of offering flowers to the gods and evolved into placing flowers in designated spots around a room to `find and capture’ the Japanese spirit. Hiroki Ohara, the fifth generation headmaster (at the age of 6!) of the Ohara School of IKEBANA, one of the three major such schools, demonstrated a one-of-a-kind flower arrangement by assembling a lunar landscape from dozens of flowers and branches, creating like a Jazz musician improvises, inserting flowers into the paper mache backdrop then doubling back to snip off ends and buds to achieve the desired effect. The entire creation of the mural took about 20 minutes, and inspired awe throughout the audience. His demonstration was followed by a half-hour discussion between Professor Thurman and Kojun Arai, who had a Western disciple translating into English. After a lively discussion differentiating Shingon Buddhism from other forms, Arai’s Shomyo no-Kai choir took the stage. One of the oldest living forms of vocal music, shomyo is believed to have originated in India before traveling along the Silk Road and entering Japan in the 6th century, where it has been practiced ever since. The glorious, reverberating voices of Buddhist priests in brightly-colored robes from the Shingon and Tendai sects — whose mission is to showcase the beauty of shomyo as an art form — filled the auditorium and brought the evening to a glorious and hushed close, sending the audience out into the cold evening with warmed hearts and a renewed appreciation for the relationship we all share with Nature and each other. Japan Week in New York this year runs from late February to mid-March, including a curated Japan Restaurant Week promotion that highlights the classic century-old dishes that distinguish Japan’s cuisine beyond sushi. Japanese artwork of Kobo Daishi from site of Koyosan Shingon Buddhism.